The Chrysler 300 SRT8 2012 adds high-performance hardware to the elegant proportions and head turning design of the 2011 Chrysler 300C to provide the ultimate combination of world-class luxury, power and handling. With an estimated 465 horsepower and 465 lb.-ft. of torque, the 300 SRT8 is targeted at customers that seek heart pounding, adrenaline filled excitement, but don’t want to sacrifice comfort and innovative features to get it. April 20, 2011 , New York -	The success of the modern Chrysler 300 launched in 2005 can be attributed to its broad appeal. People of all ages, incomes, and lifestyles were attracted to the sedan’s dramatic styling, power and performance. The 2011 model year brought the introduction of the all-new Chrysler 300, 300 Limited and 300C. 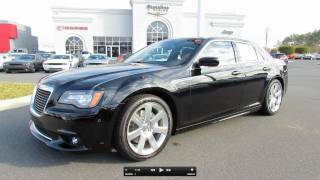 For 2012, the Chrysler brand is expanding the appeal of its flagship 300 sedan even further by launching three all-new models, all with unmistakably bold American style, luxury and performance targeted at different owner lifestyles. As the king of the lineup, the 2012 Chrysler 300 SRT8® adds high-performance hardware to the elegant proportions and head turning design of the 2011 Chrysler 300C to provide the ultimate combination of world-class luxury, power and handling. With an estimated 465 horsepower and 465 lb.-ft. of torque, the 300 SRT8 is targeted at customers that seek heart pounding, adrenaline filled excitement, but don’t want to sacrifice comfort and innovative features to get it. Appealing to younger, more urban-centric customers that want world-class sophistication combined with athletic-luxury and a more aggressive look, the all-new 2012 Chrysler 300S delivers. This 300 “street machine” features 20-inch aluminum wheels with black painted pockets, sport-tuned suspension, premium audio, black exterior accents and a monotone black or exclusive black with Radar Red interior environment. Designed to be the most luxurious Chrysler sedan ever, the all-new 2012 Chrysler 300C Executive Series with an ultra-premium leather wrapped cockpit, will appeal to customers looking to reward their hard work with a true American luxury vehicle that rivals the best the imports can offer. The return of the 300 SRT8 to the Chrysler lineup in 2012 evokes a strong comparison to the original high-performance production car of its time – the 1955 Chrysler 300. Known for simple, strong lines, excellent engineering, high levels of luxury and outstanding performance with the first modern American V-8 engine to produce 300 horsepower, the first Chrysler 300 (C-300) was styled by Virgil Exner, who radically redesigned the entire Chrysler line and created what they called "The Forward Look" in 1955. Without much chrome on the sides, his designs were simple, but strong. Exner is credited with creating the illusion of fast, forward movement. Both methods give the driver the ability to manually shift the transmission. The transmission controller calibration in “Auto” mode prevents situations that might over rev the engine; while in “Sport” mode, it allows the driver full control of the shifting schedule. Fully adaptive electronic control of all shifting makes the powertrain more responsive while minimizing harshness. In addition, drivers can manually choose between “Auto” and “Sport” settings that quickly change the shock damping and harshness characteristics from everyday commuting to more spirited driving situations. 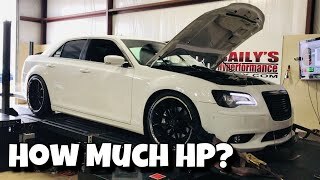 The 2012 Chrysler 300 SRT8 is one-half inch lower when compared to the base car and features new SRT-exclusive side sill cladding painted in matching body color for the “planted” look of a true sports sedan. An available Premium Leather Interior Package offers Poltrona Frau “Foligno” leather wrapped upper door trim panels, instrument panel, cluster brow and center console side panels. Nappa leather covers the door bolster, armrest and center console armrest. Chrysler brand’s signature SafetyTec Group is available on the 2012 Chrysler 300 SRT8 and packages many first-time-available features including adaptive-forward lighting (AFL), high-intensity discharge (HID) projector high and low-beams with automatic headlamp leveling, Forward Collision Warning (FCW) with adaptive-cruise control (ACC), Blind-spot monitoring (BSM) with Rear Cross Path (RCP) detection, ParkSense® front and rear park assist system, LED-illuminated rear fog lamps, exterior mirrors with supplemental turn signals and approach lamp. The state-of-the-art Uconnect® Touch 8.4N system provides all of the next-generation mobile infotainment and multimedia items to keep passengers connected between any destinations. With the segment’s largest standard touchscreen display (8.4-inches), the easy-to-use system delivers world-class functionality with an intuitive user interface that was benchmarked against the best E-segment sedans from Europe, Asia and North America. With its dramatic styling and world-class power, the Chrysler 300 has appealed to people of all lifestyles since 2005. Now, with unique luxury and style appointments, the all-new 2012 Chrysler 300S and 300C Executive Series models broaden the appeal of the Chrysler brand’s flagship sedan with even more style in two uniquely appointed directions, while delivering world-class refinement, materials and grand-touring performance. With larger 20-inch polished-face aluminum wheels with black painted pockets, wider all-season performance tires, touring-tuned (performance-tuned with HEMI® V-8 engine) second-generation E-segment chassis architecture with 25 percent quicker steering and 20 percent heavier on-center feel than the entry-level 300 model, the all-new Chrysler 300S V-6 and V-8 models are engineered for driving enjoyment. The interior of Chrysler 300S models exude an athletic-luxury theme with 12-way power driver and passenger front seats with large-bolstered and heated monotone cloth sport seats surrounded by an interior environment in black or Radar Red. Exclusive use of Piano Black on interior center stack, instrument panel, steering wheel, gauge cluster and door panel elements provide a uniquely lacquered and highly detailed appearance. Completing the enthusiast-designed interior are matte carbon hydrographic finished accents, replacing traditional burl wood. 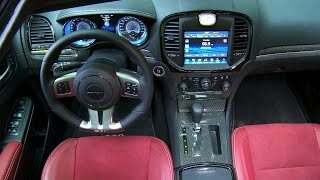 State-of-the-art Uconnect® Touch 8.4 provides 2012 Chrysler 300S passengers with the segment’s largest touchscreen display (8.4-inch) and next-generation mobile infotainment, connectivity and multimedia features. Uconnect Touch also controls the 522-watt 12-channel amplifier that integrates the heart of the Beats proprietary equalizer algorithm, creating the high-definition sound Beats Audio founders Dr. Dre, and Jimmy Iovine, Chairman of Interscope Geffen A&M Records, require in their professional recording studios. Behind the world’s first integration of Beats™ by Dr. Dre™ audio technology, the 2012 Chrysler 300S features a high-performance 10-speaker Beats Audio system. Delivering the mid- to high-range needed for studio-quality sound are three 3.5-inch speakers located in the instrument panel and two 3.5-inch speakers located in the rear doors. Two 6 x 9-inch front-door woofers provide bass, while two 6 x 9-inch speakers and a center-mounted 8-inch speaker located in the rear-shelf area provide full-range audio. Maximizing how music genres from hip hop to Motown should sound and feel, an 8-inch Beats Audio trunk-mounted dual-voice coil subwoofer with sealed enclosure delivers tight, powerful, punchy bass. 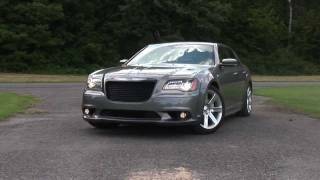 The 2012 Chrysler 300S V-6 model features the aluminum 3.6-liter Pentastar engine delivering 292 best-in-class six-cylinder horsepower through an all-new segment-exclusive ZF eight-speed automatic transmission. For even more spirited driving with performance feel, the driver can utilize all-new steering-wheel mounted magnesium paddle shifters to manually select the desired gear. Packed with a 363 horsepower 5.7-liter HEMI® V-8 engine including innovative Fuel Saver Technology, a five-speed automatic transmission with paddle shifters and Auto Stick, performance-tuned suspension and larger performance disc brakes, the 2012 Chrysler 300S V-8 delivers world-class power and refinement with enthusiast-tuned handling. Providing additional all-season confidence, the Chrysler 300S V-6 and V-8 all-wheel-drive (AWD) models utilize 19-inch polished-face aluminum wheels with black painted pockets, P235/55R19 all-season performance tires and the most advanced AWD system in its class. For inclement weather driving conditions and exceptional road manners, the all-new 2011 Chrysler 300S AWD models feature a segment-exclusive active transfer case and front-axle disconnect system. This exclusive AWD system also is designed to improve fuel economy by up to 5 percent over competitive full-time all AWD systems. No other major automotive manufacturer offers the combination of these two independent technologies. The Chrysler flagship sedan’s innovative AWD system seamlessly transitions between rear-wheel drive (RWD) and AWD with no driver intervention. When AWD is not required, the system automatically disconnects the front axle to maximize fuel economy while still providing the outstanding performance and handling inherent in RWD vehicles. Designed to be the most luxurious Chrysler flagship sedan ever, the all-new Chrysler 300C Executive Series combines ultra-premium leather – once limited to some of the most exotic Italian luxury cars – with world-class refinement and handling, state-of-the-art safety and connectivity features and the legendary 363 horsepower 5.7-liter HEMI® V-8 engine with Fuel Saver Technology. Exclusive features found on the Chrysler 300C Executive Series interior include either Mochachino or Black Poltrona Frau “Foligno” leather-wrapped instrument panel, cluster brow, center console side panels and upper front- and rear-door panels. Premium Nappa leather covers the door armrest, bolster and center console armrest. Two-tone Mochachino or Black seats are wrapped exclusively in supple Nappa leather and include 12-way power-adjustable driver and front-passenger seats (including four-way power lumbar) with two-mode ventilation and two-mode heated seats for both front and rear passengers. Specially selected Natural Pore Mocha or Pore Gray real wood trim is finished in a low-gloss to enhance the beauty of the wood. On the exterior, the Chrysler luxury flagship replaces chromed fascia, mirror and door handle accents with a unique platinum chrome finish for an even more upscale look. Topping off the unique exterior is a platinum-chrome finished grille surround with platinum-chrome sculpted grille blades for a truly distinctive appearance (late availability). Premium interior amenities within the Chrysler 300C Executive Series model include the state-of-the-art Uconnect Touch 8.4N with Garmin® navigation, SIRIUS Traffic and SIRIUS Travel Link, 160-mph LED-illuminated instrument cluster with driver-selectable color EVIC, heated and leather-wrapped steering wheel, power tilt and telescoping steering column with memory, power-adjustable pedals with memory, power backlight sunshade, premium 18-ounce berber floor mats with nubuck trim, satin chrome lower door sills with “Chrysler” logo, dual heated/cooled cup holders, ambient lit foot well lighting, LED illuminated interior door handles and front and rear map pockets, premium carpeted trunk mat, HomeLink universal transceiver and power-folding chromed exterior mirrors with memory, auto-dimming and auto-tilt in Reverse. 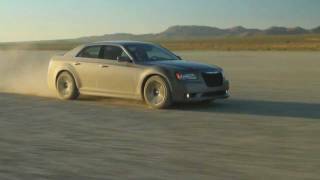 Available in rear-wheel drive or with the segment’s most advance AWD system, the 2012 Chrysler 300C Executive Series models arrive at Chrysler dealerships in the fall of 2011. The Chrysler brand has delighted customers with distinctive designs, craftsmanship, intuitive innovation and technology – all at an extraordinary value – since the company was founded in 1925. Whether it is the groundbreaking, bold design of the Chrysler 300, the “family room on wheels” functionality of the Chrysler Town & Country or the sleek elegant styling of the new 200 mid-size sedan, Chrysler brand vehicles reward the passion, creativity and sense of accomplishment of its owners. Beyond just exceptionally designed vehicles, the Chrysler brand has incorporated thoughtful features into all of its products, such as the Stow 'n Go® seating and storage system on the Chrysler Town & Country, the fuel-saving Multi-Displacement System (MDS) in the Chrysler 300 and Uconnect phone utilizing Bluetooth technology and voice command on the Chrysler 200. The Chrysler brand is experiencing a rejuvenation and product is at the heart of it, replacing its full lineup with either all-new or significantly improved vehicles for 2011. The recently introduced new Chrysler Town & Country minivan and Chrysler 200 sedan showcase the brand’s “design with purpose” that will be evident with the-soon-to-be-released all-new, next generation Chrysler 300 and the new Chrysler 200 convertible.